Steven D. Levitt is an economist who seems to go out of his way to research topics that beyond the norm for others in his field. However, for the majority of us, they are actually topics we would be interested in knowing more about. For example, is it more dangerous to let your kid play at a home that owns a gun or one that has a swimming pool? Do real estate agents actually have the seller/buyer’s back? How important was Roe vs. Wade in terms of lowering crime rates? More than anything Levitt touched upon these topics but most importantly he explained it clearly and easily. My favorite part? 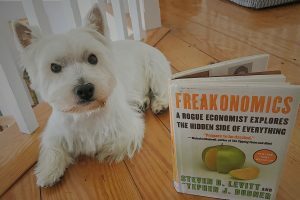 The “freak” in Freakonomics. For all you Malcolm Gladwell fans, this book contains the fun factor and randomness that “Blink” and “Outliers” were missing. It keeps the curious public interested for longer than the first few sentences. I love that, especially when it is a topic that will make me feel smart for understanding. Surprisingly, a quick read and never was dull. I should of picked this up a long time ago but just needed someone to remind me that it wasn’t going to be stale despite the word “economics” in the title.